In scanwidgets Thread about an passiv RFID emulator i have met Dlinyj. He has told me of this emulator. First i have build Michal Krummnickels(mrl.cz) emulator on a test PCB. After that i had decided that i need a life connection to the computer to emulate fast and easy RFID tags. It can emulate/simulate 125khz EM4001 compatible RFID tags. I have written a C program for the Microcontroller and for the Computer. You can download the Program here. Please excuse me that i have comment the programs in german. 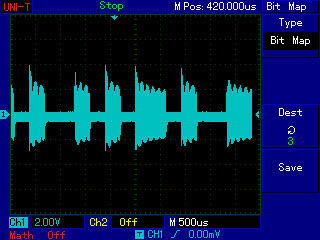 The Computer sends the finish calculated ID over the RS232 connection to the Microcontroller. The Microcontroller receives the ID and emulate it. The Baud rate is 9600bd. 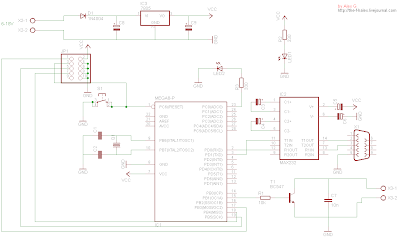 I have compiled the Microcontroller program with AVR-GCC. I have used Avr Slax to compile it. 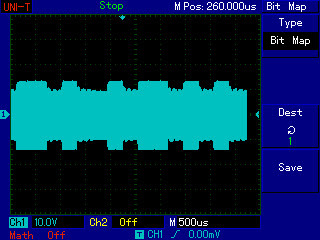 As you can see at this pictures a Bit is 512µs long. You can see clearly the ON and the OFF in a Bit period. The EM4001 transmits a 64bit long ID. An ID is transmitted in 32.768ms. If you have some questions or need some help just ask. If you need more information about the manchester coding is here the EM4001 datasheet.